I wrote this article back in January of 2008 when Lee and Petty were seniors at Murray State. 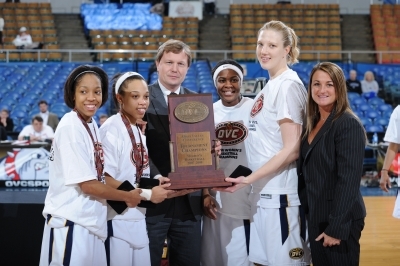 They are pictured here in March of 2008, after winning the OVC tournament, along with fellow seniors Gerraca Matthews and Angela Brown in addition to OVC commisioner Dan Beebe and Lady Racers' head coach Jody Adams. Alaina Lee and Shaleea Petty have so much in common it’s spooky. They are both small point guards, they both wore glasses when they were young, they have both played on all-boys teams, they were both injured as sophomores, they both want to be college coaches and they both love to shop. Okay, maybe the last one isn’t that surprising but the rest is a coincidence on caffeine. Lee grew up in Houston where she played basketball with her brothers. “My brothers are three and five years older than I am,” she noted. “But they never took it easy on me when we played ball. That's a major reason why I'm where I am today. I couldn't beat them when I was younger but now I can and they don't even want to play me any more. Lee went on to play all four years at Madison High School where as a senior she earned first team all-state honors and was the district MVP while averaging 12 points, seven assists and four steals. MHS won 119 games while losing just 19 during her career. She also attended the prestigious Adidas Top 10 camp. Petty grew up in Hopkinsville where she played on a boys’ traveling team. “I played on a boys AAU team when I was in seventh grade,” she recalled. “It was tough but it made me better. It made me tougher but I got really mad when my glasses got knocked off. Petty played all four years at Christian County High School where she led the Colonels to three consecutive Sweet 16 appearances. As a senior she was named to the Sweet 16 all-tournament team. She was also an honorable mention all-state selection. Like Lee she averaged 12 points as a senior to go with six assists and six steals per game. Petty was recruited by Murray State, Tennessee State, Eastern Kentucky and Austin Peay.